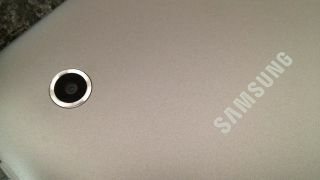 Could the Exynos 5 device arrive in 2012? ARM has talked to TechRadar about a next-generation Samsung product featuring a powerful new Mali GPU product, and the chip giant's timeline for its products could suggest a 2012 arrival. It's no secret that forthcoming Samsung's Exynos 5 chip will extensively feature ARM designs, and that includes the quad-core capable Mali-T604 GPU. And with ARM expecting the first of its T604 products to arrive in the second half of this year, then obvious question posed by TechRadar was whether it would be a Samsung phone or tablet. "The Galaxy S2 has got the Mali-400 in and the Samsung Galaxy S3 also has the Mali-400 in," said senior product manager Steve Steele. "Samsung announced at MWC that their next-generation platform Exynos 5 has the T604 in, so don't join too many dots together but clearly that's coming through at some point. "The first product [featuring Mali-T604] may not be a phone – we shouldn't assume anything." Samsung isn't in line to launch the first from Google (that honour will likely go to Asus) but the Korean firm is tipped to be launching a Nexus tablet in the future based on the Mali-T604 and the Exynos 5 CPU. "It's been a great flagship for us," added ARM's Jem Davies. "You're selling IP which is completely non-visual of itself but it's destined for a visual purpose. "You need something to show people. We're very grateful to Samsung. They are very keen." ARM has launched the follow up to the Mali-400 (which features in the Samsung Galaxy S3) this week, and it's a major step forward, according to the firm. "We're launching the Mali-450 which doubles the capacity of the Mali-400 taking it from four cores up to eight cores," explained Steele. "It's worth bearing in mind that the same driver software platform runs all the way back through the series to the Mali 200 and through the 400, so you can slide it in underneath [current designs] and the job's done."